From DominiGames, the studio that brought you the Dark Romance series, comes the latest adventure in the Labyrinths of the World saga! For centuries, the noble muse Calliope has blessed all kinds of artists who have traveled to her city and asked her for inspiration. Today the city is famous for artists and attracts people from all over the world. But when a dark force tears Calliope’s essence into three parts, you must step in and gather them back together, before the whole world loses its creativity. Calliope’s essence has fled into art buildings and sealed itself away and anyone trapped inside. But beware, someone is watching from the shadows and they are coveting Calliope’s powers for their own dark desires. 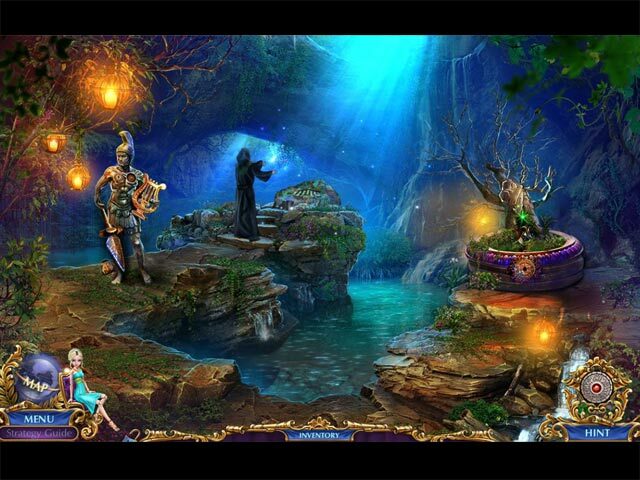 Uncover the mystery behind an ancient evil force! Find hidden olives to customize your menu bar! Collect coins to furnish your personal wardrobe. Achievements, Harlequin’s Costume Gallery, Soundtrack, and much more! 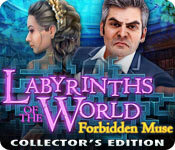 Labyrinths of the World: Forbidden Muse Collector's Edition is rated 3.5 out of 5 by 46. Rated 5 out of 5 by Majestyx12 from Painters, Sculpers, Musicians and Poets. The Artists seeking inspiration have their patron muse Calliope. She is missing and they need our help. This game came out in June 2015 and is second in this series. The hops are plentiful and most are interactive. The puzzles are relaxed and are the one's I liked. The extras are collecting olives with leaves to spend on furnishing your Boudoir. Finding coins in vases to buy Interface to decorate your tool bar. 5 music, 11 concept art and 20 wallpaper. Since some hops are lovely and the mini-puzzles are to my liking. I would have like to have replays. No replays on hops or mini-puzzles. This was disappointing. This series started out with a small doll to do your bidding. This game changed Harlequin to a Barbie like doll where the first one was more of a invention. It wasn't so bad until you see a picture with a actual doll that wasn't so good. If they drew her picture, it would of been better. I liked the throwbacks to other Domini games. I didn't mind using things to further my tasks. Magical palette, enchanted tuning fork and mystical notebook. They were by the hints and you pick them up when you want to use them. In the bonus chapter you have to power up the medallion with music. Picking it up to get the music and then picking up the medallion and use it on things. I would recommend this game only for those who like the things I mentioned. I had fun. Rated 5 out of 5 by tutortime from I enjoyed it ! Great game, long, beautiful graphics and colors. Storyline was interesting and mini games not the usual fair. The CC edition was worth the money as it had all new storyline and was also long. The Barbie doll was not a plus, but not a negative either. I would have preferred morphing objects or extra hidden features in the game. Rated 5 out of 5 by Mernon54 from Enjoyed this! I agree with boatgirl4347. I loved the game. Relaxing fun.Really liked my little helper. Rated 5 out of 5 by 53_model from Great Graphics and a nice twist I don't comment much on the storylines until I actually go through a whole game, but this one seems fresh!..Have seen some people not like the little "doll" helper feature, but thought it was really cute and added just a little extra to the great graphics of this game...HO's are good, not too hard...Puzzles are different and tried hint button which worked well..All in all a really good game! 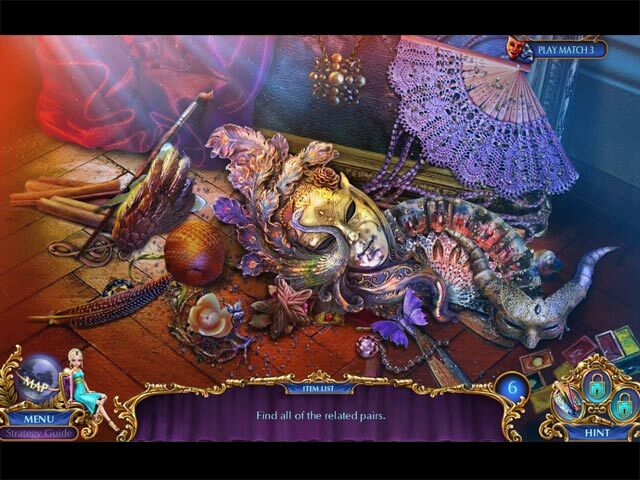 Rated 5 out of 5 by MSBAM100 from The muse Calliope has gone crazy! This game is a bit quirky, but I like it anyway. It doesn't take a lot of thought, and sometimes easy fun is OK. You are a detective who is sent on an agency test to find the three essences of the arts patron Calliope who has gone off the deep end. Every time you see her, she wreaks havoc -- destroying statues, setting fires, releasing snakes. Not to worry, though. You have a Harlequin doll, who dons different outfits you find and can fix things, or charm snakes, or whatever. You also get a magic paint palette that brings pictures to life -- a marmet, a dragon, and others. These critters also help you out, reaching areas you cannot. I like the HOS as well. You find silhouettes that complete parts of the scene. Or you find pieces that are mentioned in a story. I also like the coins you find that allow you to spruce up your user interface. Plus you find olive branches that let you decorate your boudoir. I like this type of CE bling. You also get to see a picture of Harlequin in each of her 14 outfits. The demo was a bit short, but enough for me to decide I like this game. Try it yourself and see! Rated 5 out of 5 by caliehs from So It's Not An Expert's Game While I generally don't like "helpers" in the game, this one is not too bad. The usage is quick, you don't have time to go make a sandwich each time the helper is needed. Overall it's a great slow down / easy play game. Sometimes that's just what you want!! Rated 5 out of 5 by boatgirl4347 from HEY GUYS ITS NOT SUPPOSED TO BE ROCKET SCIENCE!!!!! I OBVISILY DISAGREE WITH ALL TOP REVEIWERS I LOVE THESE DEVS ITS FUN!!!! I BOUGHY IT AFTER DEMO DOMINII GAMES RUN SMOOTH AS BUTTER THE MAP IS EVEN BEAUTIFUL SURPERB SPECIAL EFFECTS STUNNING COLOR I EVEN LOVE MY LITTLE BARBI!!! IVE BEEN IN THE FIRST BUILDING FOR 2 HOURS AND AM THRILLED THERE IS STILL TWO MORE AND BONUS HAVING A FUN RELAXING GOOD TIME!!! THANKS GUYS!!!! Rated 5 out of 5 by Daxadillion from I liked this game with the exception of just one thing …… ….. the Barbie doll. Who throughout the game has to be dressed up in well over 10 outfits and has to complete a task. She was totally unnecessary and mind numbing, but I got over that after remembering that I used to behead my older and younger sisters’ Barbie dolls and baby dolls as I was a tomboy aged 7 at the time, but 50 years later I can still see and laugh at their horrified faces! I am not adverse to Helpers, for example we could paint a squirrel with our magic palette and it came to life to do a task we couldn’t, and then shortly after that we painted a dragon that lit up a dark scene when we couldn’t, so I think the devs should have stuck with that theme rather than the Barbie doll. The graphics were good, the voices/lip synch also, except for the woman in the first “essence collection” chapter, as it looked like she had teeth that were merged together, no gaps and nothing to indicate they were individual teeth. Collectibles are Olives and Coins, and even though I have completed the game I am not sure what to do with the olives. The game says I can use them for the Interface Shop and apparently you can use the coins for decorating your Boudoir. After having a look at the Boudoir I did want to run a mile away from it as it was so tacky. Length: 7 Chapters plus the Bonus but not a stand alone game, more like an addition to the game after Owen has decided to be a nice guy. Levels: Easy to Custom. Hints/Skips 15 seconds to 90 seconds. HOS: During the demo they were all the same (silhouettes) but after that they changed to lists or pictures and I enjoyed them. You can play Match 3 instead. 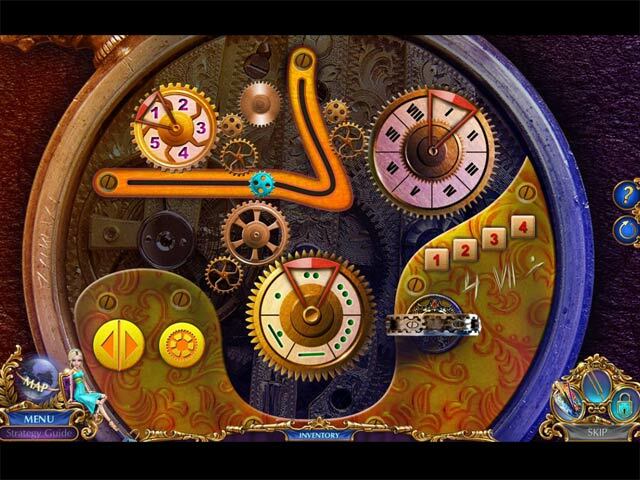 Mini Games/Puzzles became more difficult, I have to admit I skipped a few of them as I couldn’t work them out which is unusual for me. Achievements: At least over 20. I do recommend this game as I had a fun day with it, but also I do understand why it has been given a bad rating, aka the Barbie doll. I think these devs should pour more excitement (and no dolls) into their demos because that’s the “make or break” deal! And they should research what a Harlequin really is as it is definitely not a dress-up Barbie doll. It’s a Marmite game as you either love it or you hate it! Can you help the City of Artists find their lost inspiration?